The ThINKin' Spot: Sneaky Peeky Time and A New Challenge! Sneaky Peeky Time and A New Challenge! Good morning! This is a long post today, so be sure and scroll all the way down. I don't want you to miss a thing. The excitement around here is positively contagious as we get ready for the big reveal of our new stamp sets tomorrow at Peachy Keen Stamps, and I have a little sneaky peeky for you today! This card is made with the new Stamp of the Month set (available tomorrow), and are you EVER going to love it! It's got SO many wonderful images in it to work with, and the creative possibilities are endless!!! I used the sweet little gnome girl for my card today. I stamps her with Momento Tuxedo Black ink and colored her with Copics. All of the patterned paper and card stock that you see here are a part of the new Peachy Picks Kit that will be coming out tomorrow, too. If you haven't gotten one of these kits yet, then you are REALLY missing out! There are so many wonderful things included, and again EVERYTHING you see here was a part of the kit. Paper, card stock, ribbon, buttons, paper banner. It's all there, and so much more! For more inspiration and sneak peeks, be sure to visit the Peachy Keen Stamps Blog, because some of our other designers have some fabulous things to share, and scroll back to yesterday's post for even more sneak peek inspiration!! As I mentioned above, this is a shadow box card, and the directions can be found HERE on Splitcoaststampers. I stamped the CB-09 Gracee Goose stamp, which is a Country Bumpkin image with Memento Tuxedo Black in and colored her with Copic markers. The patterned paper is some from my scrap bin, and the card stock is from Stampin' Up!. The cute little sun and sentiment are the PKM-16 You Are My Sunshine stamp set from Peachy Keen Stamps. I added a couple of gemstones to the frame and on her necklace and the rhinestone brads for some bling. The grass was punched with a Martha Stewart grass border punch. 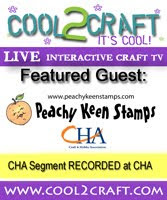 Be sure to check out the Peachy Keen Challenge Blog to see what the rest of our designers have created for this challenge, and it would be wonderful if you can join us for this challenge, too. There's always a chance to win a prize if you play along, and you could have a chance to be one of our Top Peaches! Oh, and before I go, have you heard that we're having a release party tomorrow? Yep! 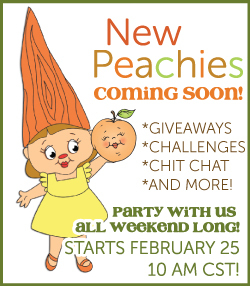 Join us at 10 a.m. CST for a release party to celebrate all this new peachy goodness! You'll be able to chat live with our designers, we're going to play some games, and offer you a couple of challenges to play along with this weekend, and of course we're going to be giving away some stamps. Click on the button below to take you to The Peachy Keen Connection, make sure you're a member, and look for the link on the front page tomorrow morning, which will take you directly to the release party thread. Hope to see you there!!! Whew! I know this was a long post today, but there was just so much to share with you! I thank you so much for dropping by for a visit, and I wish you a beautiful day filled with blessings and lots of happy stamping! Your "gnote" card is really cute! I absolutely love the way you colored Gracee Goose! Beautiful! SOOOO cute Lorie!!! LOVE your coloring - as always!!! Adorable! The "gnote" sentiment is just priceless! And the beauty on the sunny landscape for your goose is stunning. I so planned on being there tomorrow...then baseball practice was changed to 11am....next releases I will be there for sure! Beautiful projects! I absolutely love all of your details and of course your coloring is fantastic! Wow! Terrific card, Lorie. Love the shadow box. I haven't tried this before and you are inspiring me!! BTW, your beautiful card is reflecting our weather here in the sunny,warm AZ desert! Come on down!! Aaadorable cards!! Your gnomie is incredibly cute!! I love the colors!! I love your shadow box those stamps are too cute!! TFS!! Take Care! !